First of all, I’m very sorry. It’s been awhile since I have written a blog entry and I know all 3 of you have been waiting anxiously for some more material to read. I turned 40 in November and basically spent the entire month celebrating (that’s how I like to roll at birthday time). Now that it’s December, I think it’s time we catch up, don’t you? Ouch. That reply spread through social media like a wildfire. At first I didn’t really care, but after a little thought, it pissed me off. What if I had been an absolutely new person to bourbon and gotten that response. “Read the label”….the average person can’t read the label CAUSE THEY WILL NEVER F–KING SEE IT. I guess he meant, “Google each bottle and read the label”. Got it. The smugness of the response pissed me off. Anyway after that I started a brief war on Van Winkle. I had a few tweets about ‘overrated’ Pappy, tagging Julian, etc, etc. I tried to rally the interwebz to finally declare war on Pappy Van Winkle and end the craze over this product line that has been spiraling out of control ever since Anthony Bourdain opened his trap a few years ago. As I plotted my war strategy over the course of the next few days, I had several people tell me Julian is actually a really nice guy and that maybe he didn’t mean it as harsh as it came across. In truth it is hard to express tone when you only have 140 characters to respond. It took me a little while but I got over it and I ended my war on Van Winkle. It’s not my place to start this war and get people to open their eyes and change their ways. I didn’t start the Fire. I guess the main reason for that whole segment is to say my review here was not biased by that incident. Let it be known I went into this review with a completely unbiased, open mind, and without a grudge. A friend of mine was given the opportunity to purchase a 2016 23 year Pappy given the premise that he would show them pictures that he opened it. I actually love that a liquor store did that, and I love even more that he sent me a free 1 oz sample to try along with some of his soon to be world famous beef jerky. The sample didn’t last long. That night I started with an Eagle Rare pour to help cleanse my palette. I also sniffed some coffee beans (thank you to Willie Pratt for that tip). First thing I noticed is it’s very thick. It reminds me a little of EC23 but just a tad lighter. It’s definitely got some of that thickness that I like in older bourbons. The nose was great as you would probably expect for a nice aged wheated bourbon. I’m going to use the same 3 words to describe what I smell in a good bourbon: caramel, honey, and cinnamon. I mean how many different ways can you describe that smell? It smells great. So I tried a few sips, swished it around, noticed that of course it’s a nice bourbon. Nice smooth buttery wheater. No one is going to sip Pappy 23 and say this is gross. What they WILL say is….damn…that’s very one dimensional. There wasn’t much else to it except a decent flavor. The finish was almost bitter to me and the taste just never changed. 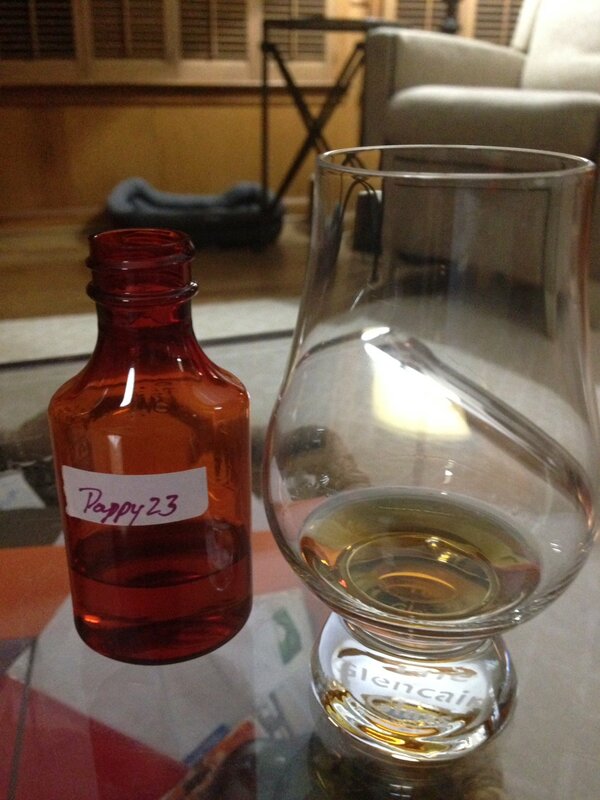 I called up my buddy Chuck from a few doors down and asked if he would come help me try Pappy 23. I heard his dog drop to the floor and he was in my living room 7 seconds later. He completely agreed with me. Smells great, tastes good, finishes bitter. We each sipped it until it was gone and sat there as unimpressed as Simon Cowell watching Waka Flocka Flame sing the National Anthem. You were honestly just curious to hear my review, to read an article about bourbon, it did not impact you at all. To you guys I say, thanks for stopping by, come by again soon! You have a chance to get a bottle but the price is more than you want to pay or more than you want to trade for. My advice is this. On one hand, having an open bottle of Pappy 23 is pretty awesome. 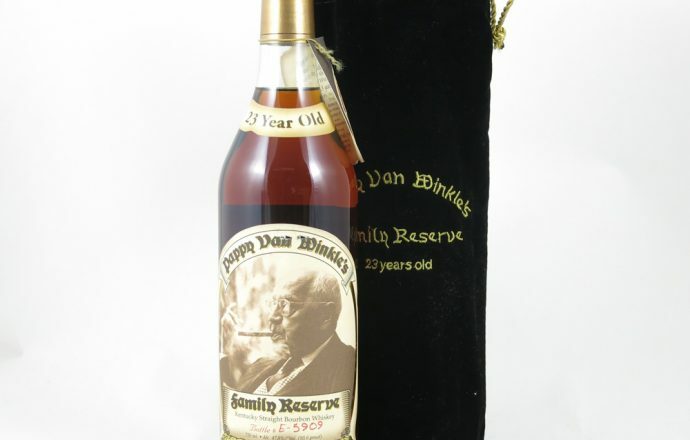 The bottle is beautiful, the brand is well known, and if you pour your friends even the smallest of samples, they will regard you as a complete badass and tell their friends you poured them Pappy 23. The visual experience will surpass the oral experience (you get what I’m saying). Drinking bourbon isn’t always about the flavor, it’s also about memories, friendships, and connecting with people. If you are a person who regards any of those experiences as much as the taste then I say open it and enjoy it as it was meant to be drank if you got it at retail. On the other hand, as long as there are morons out there who think the current distillation of Pappy Van Winkle is as good as the no longer produced Stitzel-Weller version, then by all means trade it or sell it to reinvest in different bottles. These days Pappy has become known as “Pappy Gift Cards” because truly the higher end bottles are held and traded and sold to acquire more bourbon. And until the people who are paying ridiculous prices decide to move on to something else, and the craze of Pappy begins to die down, take advantage of the market. 14 Comments on 2016 Pappy Van Winkle 23 year review. Kerry, I would say that your description is spot on. While yes this bottle of bourbon is good an maybe worth the retail price, there is no way it is worth the current secondary prices, that is unless you just need to impress someone and in that case I feel sorry for you. To many of the bottles sit as trophies, unopened on shelves, and get talked up to epic proportions. I would cash in my Pappy gift card and buy some real gems like a CGF Wild Turkey, Jefferson Presidential 17yr or even an 1/4 barrel of Old Weller Antique. Hey ok!! I’m a fan if PVW 15. 2015. Complex. And not a guy. Honestly, I don’t have an opportunity to purchase PVW 23 for under $2600, PVW 20 for under $2000, and PVW 15 for under $1500, so I decided to try other bourbons. My go-to favorite is Parker’s Heritage #8 Wheated (13 yr old). If I have the means to purchase a SW PVW 23, then I’ll enjoy. The 23 isnt worth the retail price it currently sells for. Also it is most definitely not worth the 2ndary prices people are paying for it. It does have a good nose, and the first taste is great, but then comes the after tast effects of sitting in the barrel for 23 years. I could nibble on some Oak chips and get that same flavor and crappy after taste. I am thankful for not buying the 23 year, missed a 20 by a few minutes, ended up with 15 and a VWFR lot b, which I liked alot more, oh so much more then the 23. Cheers. 15 years is probably the longest any bourbon should be aged. I absolutely agree Stagg and Weller are the top of the line, and at $80 a great find that comes around every year. I am so spoiled. After having Pappy distilled from 1969 and 1974 and then tasting them side by side with the 15 and 20 from within the last three years I see how over-rated Pappy is today. It is a good bourbon for sure, but I have had some blind tastes with stuff from the 1970’s and 1980’s along with things as easily accessible as Larceny and it is enlightening. Fun to find unique and rare bottles and open them with friends, but honestly there is so much good bourbon and rye out there these days. I rarely find a bottle that I feel is worth more than $100 and honestly I would just barely put the Pappy there. The $40-60 price point gets you some damn fine bourbon. Don’t become a Pappy-Poser (although I have to admit I was as well until I experiences enough great bourbon!). I agree with Dave C, GTS is the ultimate and you can get a lot of Stagg for a 23yr PVW! I have had the opportunity over last ten years to own various vintages of the VW Brand. For many years I judged other Bourbons against PVW. Not any more as I completely agree with the other contributors to this post. I find a number of other brands as or more satisfying and therefore find myself reaching less for a VW bottle. My personal go to bourbon- great taste and great value is Blantons. Well, I haven’t tried the 23 this year, but I. Did snag a bottle of ORVW at retail, and was very disappointed! It has a similar bitter finish that you spoke of! Last years bottle was much better! If I had sampled before I bought, I would have saved my money and bought 2 bottles of something else! I also got a bottle of WLW at retail, and it is awesome. My experience is in agreement: Wonderful to drink and enjoy with friends, but not worth the high prices. I sold most of my PVW, saving only a pre-2000 15 yr and PVWFR 13 yr rye. My favorites are GTS and WLW, now also impossible to find, and also the Parkers Heritage collection. Four Roses SB and EC barrel strength are my go-to libations now, although I’m impressed with many small-craft offerings like Woodinville and Balconies. Yum. The 15 & 20, even the recent releases are better than the 23 proving (IMHO) that 23 years in oak is too long for a Bourbon. Pappy’s on the secondary market is a sucker’s bet at the price. I have done taste tests with the twelve year old and it never has won. Pappy’s, like the Emperor’s clothes are hype.